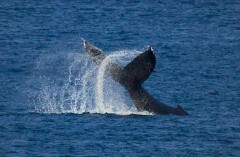 A humpback whale was swimming off the coast of Ginama district of Kunigami Village on January 11. In the morning of January 11, two humpback whales swam 200 meters off the coast of the Ginama district of Kunigami Village. They moved slowly, occasionally shooting up a spray of water and slamming their tail fins into the surface. In summer, the whales stay in waters in high latitudes such the sea near the Aleutian Islands. In the winter, they migrate to warmer waters in lower latitudes in order to breed. The whales appear in the waters around Kunigami from January to March every year. February is the best time to watch whales off Cape Hedo and other areas. On January 1 and 2, people saw the whales off Cape Hedo.